This article was originally published at StrongerSundays.com. I learned how to best serve pastors, and in the process discovered my niche. I actually love to do research, and there are more like me out there. As a content research consultant, I help pastors deliver killer original content week in and week out, while also giving them time to spend on what really excites and energizes them. But as with any job, there are ups and downs. I love doing the one thing I do best, but it can also be a lonely endeavor at times. I spend more time with books than with people most days. It’s great to have a direct impact on literally thousands of people – many more than if I had my own platform. But that also means I don’t get much credit for my work. Much of my work is as a ghostwriter and by definition I’m heard and not seen. Having a content researcher can easily increase your effectiveness as a pastor. And if you’re one of us who loves to research, it can be a highly rewarding experience as well. If you’re thinking of becoming a content researcher, or if you’re a pastor who’s thinking about hiring one, let me give you a few tips to keep yourself balanced. As a content researcher, you’ll be privy to the inner-workings of a church. And if you have a strong opinion (like I do) then you’ll likely find yourself disagreeing with a certain decision or philosophy. That’s normal, and that’s okay. But you have to remember that it’s not about you. The words you’re writing aren’t really yours; they’re someone else’s. And that person has a specific philosophy, calling, and even style for how they do things. You’re a servant first and foremost, and your own opinions need to be take a backseat. Here’s the deal – you’re going to spend hours on a project, pour your heart and soul into it, wake up at night thinking of the perfect line. You’ll type it up and feel like you’ve created something of significance. You’ll love those words you wrote! And then they’ll get cut. In one quick flick of a red pen, your best words will be reduced to nothing. That’s okay. Remember it’s not about you. Those aren’t really your words, they’re the pastor’s words. And just because they don’t like that one line doesn’t mean you failed. Just tuck it away for another day or another pastor. I can’t stress this enough. You have to be willing to do what the pastor asks of you when they ask you. You never know when inspiration will strike you as a writer, but you’re also subject to the pastor’s inspiration as well. I’ve gotten calls while picking up the kids after school, while shopping at the mall, or even on the golf course. Flexibility means I stop and take the call, because the pastor’s voice is so vital to my work. If you’re a pastor, you’re probably a great communicator. In fact, you’re likely the chief communicator at your church. But that doesn’t mean you have to be the best researcher. You hired a children’s pastor, a worship pastor, maybe even someone to oversee missions. Those people were hired because they have expertise outside of your own sweet spot. The same goes for a content researcher. Let them do their thing and they can be a great asset to you. Let your content researcher know when they’ve hit the mark or when they need a course correction. It’s frustrating to see edits without getting an explanation, or to hear changes in a sermon after the fact without feedback. If you don’t let them know they’re doing a good job, they may be less likely to repeat those wins. And when you end up cutting something, the assumption is they failed when there are other factors involved. Feedback always clears the air. It’s hard for me to explain to people what I do. 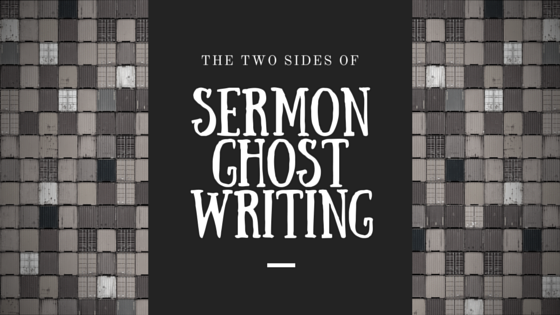 Some have actually been offended to hear that a pastor would use a ghostwriter. That means I usually have to keep a low profile. But rewarding your content research doesn’t mean you have to broadcast to your audience who they are and what they do. There are other ways to reward them. One way is to compensate them fairly. Think about how valuable your time is. Now, how much time did they save you because they did the research you had no time or desire to do yourself? Another way to reward your content research is through contacts. You probably know other pastors who could use the help of a content research as much as you have. Those contacts can mean increased work – and increased compensation – as well as a wider platform. Your researcher probably has other projects on the side, from a blog or a book idea to their own speaking career. Helping them achieve those dreams is a great way for both of you to be rewarded. Content research doesn’t have to be a chore, and it doesn’t have to be thankless endeavor. The relationship between pastors and researchers can be one of the most mutually beneficial of any in the church. Cultivating those relationships can help the two of you sync up and fulfill multiple goals in half the time. It’s true! Two are better than one.